From last 3 months there is no more than 3 days with downtrend, so today should be a day where price should go up, however this have not happened until 15.00 PM, and the day finished almost at same price that was open. I had 3 trades today, first trade was by error because i opened position out of my trading hours, later 11.30, at 11.45 aproximately, when i noticed that inmediately closed position and i got -1 tick negative. If i had not close my position inmediately i was loose 4 ticks instead only 1. My second trade, as you can see in the picture below, all conditions were good to enter the trade, so i enter short 2438 at 14.41 PM with TP at 2434 and SL at 2442, but in few minutes prices reached my TP but my order was not filled, and 3 minutes later my Stop loss was reached. This happen only 10% of the times, perhaps i should increase stop loss a little. Before third trade at 15.00 aprox. i have another opportunity, but i was distracted thinking whats going on with my last looser trade, we are not machines, after i recovered my attention to the chart, i entered in my third trade of the day short again at 2432 with TP 2429 and SL 2436 and i got +3 ticks. Written by mjose. 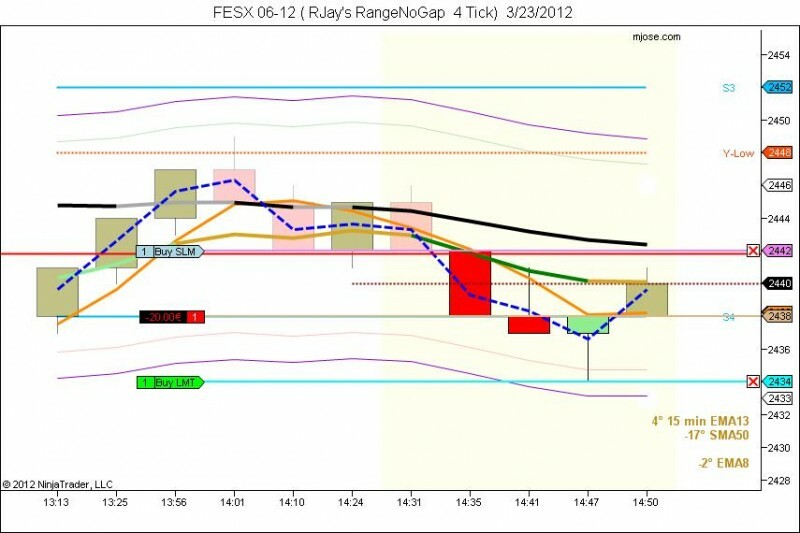 This entry was posted on 23/03/2012 at 11:05 pm and is filed under Trading Journal. You can follow any responses to this entry through the RSS 2.0 feed. Tagged increase stop loss, strange trade, three trades	You can leave a response or trackback from your own site.